All those who have come to faith in Jesus will one day appear before the Judgement Seat of Christ, yet how many people know exactly what will happen there? The word commonly translated judgement seat or tribunal in the New Testament is the Greek word bema. Whilst not true for everyone especially those outside of Western - style Christianity, I believe it is fair to say that the doctrine of the bema must be one of the most misunderstood teachings in certain quarters of the church today. As far as I have seen it is rarely mentioned, and when it is, it is usually pictured as the place where all Christians receive their rewards before entering the heavenly Kingdom. This of course fits very nicely with our preoccupation in the West of assuring all who come to faith in Christ that they are eternally secure no matter what they do. Proponents of this view cite the ancient Olympic Games as their point of reference, as the athletes used to appear before the bema to receive their victory laurels. However, let me ask you this question. Are we supposed to interpret God's Holy Word according to the standards set by a pagan, ungodly event, or should we allow the Bible to explain itself, considering that how the word is used throughout the scriptures would give a good indication of how we should interpret it in this passage? I personally tend toward the latter viewpoint. The word bema is used in four separate incidents recorded in the Gospels and in the Acts of the Apostles. The first references are in Matt.27:19 and Jn.19:13 where Jesus appears before the bema of Pilate. Now could it be said that Jesus was appearing before the bema of Pilate in order to be rewarded for being such a good Messiah and preacher of righteousness? Maybe Pilate really liked Him, had heard some of His messages and put Him before his judgement seat in order to really bless Him? Or is it not true that Jesus was on trial for His life and the evidence of His guilt or innocence would be heard before the bema leading to His conviction or acquittal based on what evidence was presented? The answer is obvious. The second time it is mentioned is in Acts 12:21 where King Herod sat on the bema whilst the people of Tyre and Sidon sought his favour as they relied on him for their food supplies. Depending upon his reaction they would be well fed or go hungry. It could go either way. The next time the bema is mentioned is in Acts 18:12 when the apostle Paul was brought before the bema of Gallio proconsul of Achaia by the Jews intent on stopping his ministry dead in its tracks. Now again, could it be said that the Jews were so impressed at Paul's ability to turn people away from their empty rituals and traditions that they made sure they would organise with the ruler of the synagogue Sosthenes, to bring Paul before the bema of the proconsul in order to reward him really well? Did the Jews beat Sosthenes because they were so annoyed their chance to bless Paul publically had evaporated? Or is it not true that they brought him here because this was the place where sentence was pronounced depending on the evidence presented and they hoped to swing the evidence against him? The final occasion is found in Acts 25:6 where the apostle Paul appears before the bema of the Roman governor Festus. Once again he is brought by the Jews intent on doing away with him, and once again the evidence for his guilt or innocence is presented to be examined and judgement passed. In no way can we read the Bible and think the bema is the place where we all receive rewards for good behaviour and that is it. It is patently obvious that Biblically speaking the bema is the place where the facts are examined and judgment is given EITHER WAY depending upon the EVIDENCE presented. This is why the apostle Paul says in II Cor.5:10 that each of us (church people) must appear before the bema to be recompensed for the deeds done in the body, according to what we have done, WHETHER GOOD OR BAD. He then goes on to say in verse 11, "Therefore knowing the FEAR of the Lord, we persuade men." The word translated fear here is more than just fright or awe; the New King James Bible translates it, "TERROR." It literally means to be put into fear. No - one would fear if they were being brought before the bema to see how big their reward was. No - one would be in terror if they knew they were guaranteed a place in heaven, just their reward may not quite be as big as the man next door. There is fear and even terror because the genuineness of your faith is going to be assessed according to what you have done in the flesh and many who thought they had an alive faith will find out that it has been dead for many years. The book of James makes it clear that faith without works is dead (Jam.2:26). If someone claims they have faith but have no deeds to back up their claim, they are deceived and on dangerous ground. An alive faith produces good deeds as surely as night follows day. There are no ifs or buts, if you truly have faith, you will have good deeds to show for it, end of story. Unfortunately today there are many people who live their 'Christian' lives thinking all is OK because the pastor said they were saved and therefore they must be fine. Churches are often full of individuals who can relate their 'salvation experience' but if their lives were examined they would have NO EVIDENCE to show for the faith they say they possess. James says such people have a DEAD faith, and this is NOT ENOUGH to ensure the salvation of your soul. Only an ALIVE faith will do that. An alive faith is the only thing that will be in your favour at the judgement seat of Christ, the only thing that stands between you and hell - fire damnation. If I were to ask you, if your eternal soul were before the judgement seat of Christ tonight, would there be enough evidence to convince the judge that you are in the faith or have you been deceiving yourself and everyone else around you? "According to the grace of God which was given to me, like a wise master builder I laid a foundation, and another is building on it. But each man must be careful how he builds on it. For no man can lay a foundation other than the one which is laid, which is Jesus Christ. Now if any man builds on the foundation with gold, silver, precious stones, wood, hay, straw, each man's work will become evident; for the day will show it because it is to be revealed with fire, and the fire itself will test the quality of each man's work. If any man's work which he has built on it remains, he will receive a reward. If any man's work is burned up, he will suffer loss; but he himself will be saved, yet so as through fire." Many people confuse this passage with the judgement of all believers at the bema of Christ, surmising that if you don't get much of a reward because you have led a selfish 'Christian' life, at least you'll squeeze through the door, "Saved yet as through fire." Many comfort themselves with these words thinking that it doesn't really matter how they live because at the very least they'll SCRAPE THROUGH in the end. However those found with NO EVIDENCE of an alive faith at His coming have NOT been building on the foundation which is Jesus Christ. They do not fit into the category of people to whom these verses refer. They do not qualify as these verses talk of those who have BUILT on the foundation which is Jesus Christ, of those who have kept hold of their faith, not those who have denied the faith they once professed, who have been building their house on the sands of the ways and philosophies of this world rather than upon the foundation which is the Rock Christ Jesus (Matt.7:24-27). These type of people will be barred from entering the Kingdom. Those who no longer have the foundation of Jesus Christ as the cornerstone of their lives will not have their good deeds judged as they are still in their sins. Any good deed they do will now be irrelevant in the context of gaining a reward from the Lord as sinful men CANNOT inherit the Kingdom of God (I Cor.6:9). If we have ceased building the house of our life on the sands of the ways and philosophies of this world to start building on the Rock Christ Jesus only to turn around later and start building on sand again, we will one day see our house destroyed. There will be NO reward for us. The scripture clearly says, "If I REBUILD what I have once destroyed, I PROVE myself a transgressor," (Gal.2:18). These verses in I Corinthians chapter 3 talking about the testing of our deeds by fire are NOT referring to those who have once been in the faith but departed from it; they refer to those who will be found on His right at His coming, those who MAKE IT into the wedding feast, who are gathered up into the Lord's barn (Lk.3:17) at His coming. These are the ones who will be rewarded for the good deeds done in the body dependant on whether their righteous acts can stand the test of fire God is going to give them. At the judgement seat of Christ our DEEDS will be MEASURED and TESTED and rewards will be given according to the QUALITY of our works. To those who have laboured in the faith, who have fed widows and orphans, have helped those who could not repay them, these will be repaid at the resurrection of the righteous. To some who have been found faithful in the things of this world, they will be given charge of cities; some will be given thrones for judgment. The 12 apostles of the Lamb will be given thrones to judge the 12 tribes of Israel (Matt.19:28) their names inscribed on the foundation stones of the wall surrounding the heavenly Jerusalem (Rev.21:14). Daniel 12 verse 3 states that those who have insight will shine brightly like the brightness of the expanse of heaven, and those who lead many to righteousness will shine like the stars forever and ever. The scripture also says that, "Star differs from star in glory," (I Cor.15:41). Though all those who inherit the Kingdom will have immortal resurrection bodies, some will be more glorious than others. Those who have learnt to become the servant of all will become ruler of all. Truly the last will be first and the first will be last (Matt.20:16). 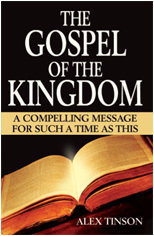 Excerpt from, "The Gospel of the Kingdom," by Alex Tinson.